Proud & Mighty Capital: If 7 or more / are ever in a single land, the Invaders win. Building Boom: On each board with / , Build in the land with the most / . 1 10 (3/4/3) Indentured Servants Earn Land: Invader Build actions affect lands without Invaders, if they are adjacent to at least 2 / before the Build Action. 2 11 (4/4/3) Criminals and Malcontents: During Setup, on each board add 1 to land #1 and 1 to land #2. 3 13 (4/5/4) High Immigration (I): Put the "High Immigration" tile on the Invader board, to the left of "Ravage". The Invaders take this Build action each Invader phase before Ravaging. Cards slide left from Ravage to it, and from it to the discard pile. Remove the tile when a Stage II card slides onto it, putting that card in the discard. 4 14 (4/5/5) High Immigration (full): The extra Build tile remains out the entire game. 5 14 (4/5/5) Local Autonomy: / have +1 Health. 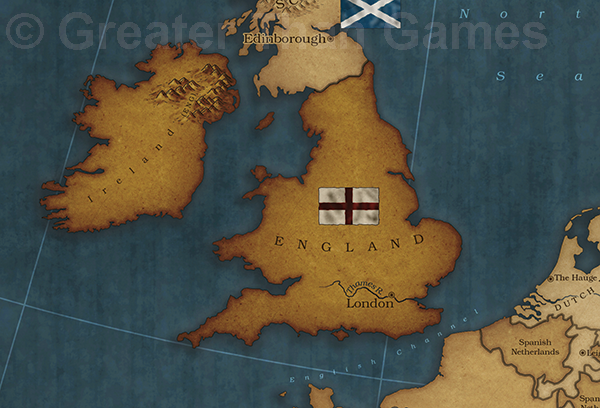 The alternate-history of the British Isles has taken a different course from our own: Scotland remains independent, for one thing, and while England is certainly powerful, neither it nor the other Great Powers of our own history are quite so dominant in this one. England was only briefly involved in the religious wars on the continent in the 17th centurly. Following a disastrous invasion attempt in France in 1633, and a clash with Scotland in 1651, the Kingdom of England focused on fortifying the Scottish frontier and building up its naval power. Unable to project power on the continent and constrained to southern Britain, the Kingdom of England was one of the first to seek colonies in the New World, using its oversas possessioins to provide citizens with opportunities that were increasingly hard to come by at home. This page was last edited on 12 March 2018, at 23:40.